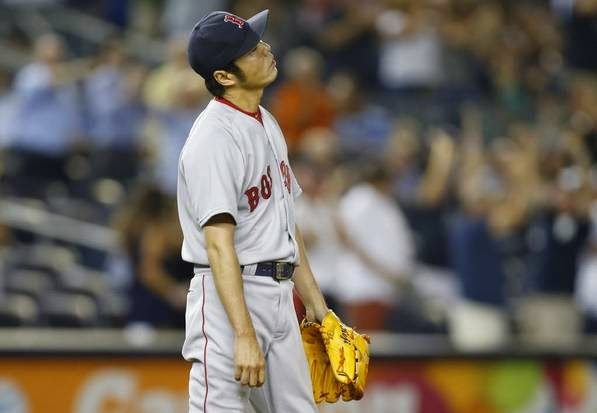 Has Koji Uehara swan song been sung? Somethings are too good to be true. Watching Koji Uehara throughout the 2013 season, you could not help but wonder at the effectiveness of his pitches. You secretly asked yourself, come on and admit you did, that how can a guy throw mediocre fastballs at 89 MPH and completely shut down hitters of all shapes and sizes with a splitter at 81 MPH? Currently at the end of a two year deal, he will be a free agent at the end of 2014. While capturing our hearts and minds in 2013, he has declined so rapidly that some are calling it disturbing. It might be mechanical, it might be age, but whatever it is, with the lack of power in his pitches he just can't have his pitches missing spots nor can he hang splitters. There has been mention that maybe Ben Cherington should have traded him along with Andrew Miller at the deadline. Some food for thought that might justify keeping him around if the issues are mechanical and fixable. Koji Uehara has a career strikeout-to-walk ratio remains the best in baseball history, by a wide margin. He has struck out 8.85 batters per walk. No other pitcher in baseball history with at least 300 innings pitched has struck out more than 5.39 batters per walk. For now the decision has been made to pull him out of the closer role. A move that was made at the request of the player himself. Koji told Masashi Yamazaki of the Tokyo Sports Press that he requested the team remove him from the closer's role b/c he wasn't performing. Uehara is well aware that something needs to be fixed. With rest, with mechanical changes, with whatever it takes but for now he is not closing out games for the Red Sox, Edward Mujica will take on that role. Farrell on Koji:"He's moved out of closer spot temporarily. We'll close w/ Mujica. Ideally we'll have him close games before end of season." For now it is not about shutting him down for the season, just providing more rest as one possible solution. A big question for the Red Sox will be whether they want to tender a qualifying offer in the neighborhood of $15MM dollars to Uehara with this sudden decline. Either way, looking forward the Red Sox could have many options in the closer role. #RedSox 2015 closer candidates: Heath Hembree, Edward Mujica, Koji, Drake Britton, Andrew Miller, Rubby De La Rosa, or another free agent. Who would be your closer in 2015 right now, a single guy or a combination of arms?